Pavilion of Slovenia opens in Arsenale on 24 May 2018 at 14:00. 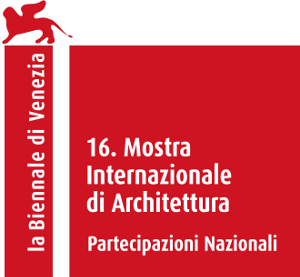 The Museum of Architecture and Design (MAO) presents the project [Living with Water] in the Pavilion of Slovenia at the 16th International Architecture Exhibition – La Biennale di Venezia. Commissioner and curator Matevž Čelik, director of the MAO, appointed a group of internationally acclaimed architects, landscape architects, researchers and educators, who applied for an open invitation to participate in the development of a joint presentation at the Pavilion of Slovenia. The multidisciplinary process of their work is presented in two installations. With the input of the entire team, the first installation was conceptualized and designed by architect and exhibition designer Bika Rebek, architect and editor Miloš Kosec and architect, landscape architect and water management specialist Marta Vahtar. 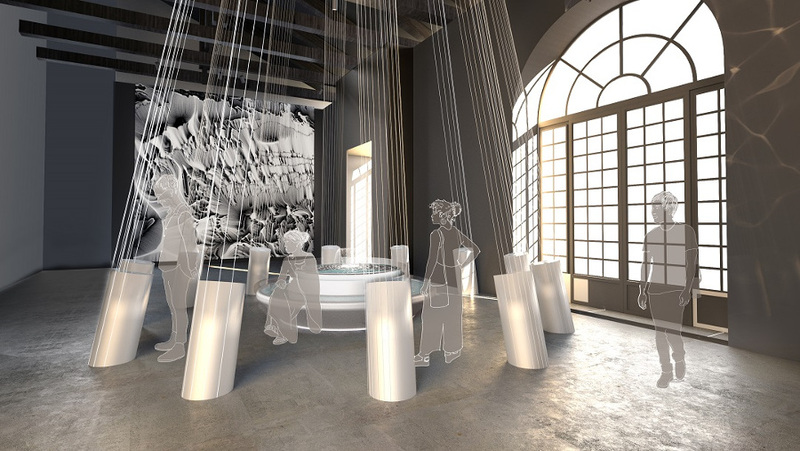 It refers to the water fountain envisaged in Plečnik’s un-built parliament building and invites visitors to think about water policies while playfully articulating their positions through an interactive infinity fountain. The team coordinated by Maj Plemenitaš and Bradley Cantrell developed a series of installations that investigate the relations between the hydrological systems and constructed structures, territory and landscapes on a range of spatial, temporal and operational scales. Furthermore, Plemenitaš and his team developed a Multi-Scale Flow Map. The presentation of the Slovenian pavilion is accompanied by an extensive publication, edited by Nina Granda, Matevž Granda and team. Living with water is a daily fact of life in Slovenia, more than it might seem at first glance. Water – from rivers to glacial lakes, waterfalls, torrents, gullies, bogs, disappearing lakes, bays, karst and thermal springs – is one of the most potent and decisive factors determining both Slovenia’s landscapes and its supply of drinking water. Water is linked to myriad myths and the subconscious, to thought and creativity, to politics and protest. At the same time, water is full of opposites. Because of water, life in Slovenia is enjoyable and satisfying, but at the same time water represents a particular danger. Nearly 160,000 Slovenian inhabitants live in flood-prone areas and some 50 to 70 floods of varying sizes affect Slovenia every year. Forecasts show, however, that with more frequent and more intense extreme weather events, these numbers will continue to grow. At the same time, the right to drinking water has been enshrined in the Constitution since 2016 and almost one-fifth of Slovenia’s territory is protected in order to safeguard drinking water resources. On the other hand, many concessions for the management of important water resources have been granted to corporations. A multidisciplinary team of 13 architects, landscape architects, urban planners, researchers and strategists explores and discusses the relationship between architecture and water, both past and present, as well as what a relationship should look like in the future. How to re-think water management and the protection of water resources? By understanding all the complexity and interconnectedness of natural and anthropogenic water systems and by developing alternative models, can we create a new, fairer, safer and less invasive living environment? Water management requires the input of informed people and important political decisions. The controversial and notorious unrealised Slovenian Parliament building by architect Jože Plečnik, which incorporates a fountain hidden under the main hall designed as and meant to represent a mythical source of wisdom for the deputies, seems like an ideal space to talk about these pressing issues. Matevž Čelik (Eranj, 1F71) is an architect and architectural researcher. In addition to his critical and editorial work, he has worked on projects related to urban renewal and urban management, and has led the preparation of key public architectural competitions in Slovenia, including the European Capital of Culture in Maribor 2012 and the new Gniversity Library in Ljubljana. Matevž Čelik was a co-founder and editor of Trajekt.org (2002), which became a key source of information on architecture and design in Slovenia. Gntil 2011 he was a member of the editorial board of the Oris magazine in Zagreb. In 2007, he published the book New Architecture in Slovenia with Springer Wien New York. Since 2010, Matevž Čelik has been director of the Museum of Architecture and Design (MAO) in Ljubljana. Since 2015, he has been the founder and leader of the Future Architecture platform, a European network of museums and festivals that supports emerging talents and promotes future thinking on architecture and a range of related issues.